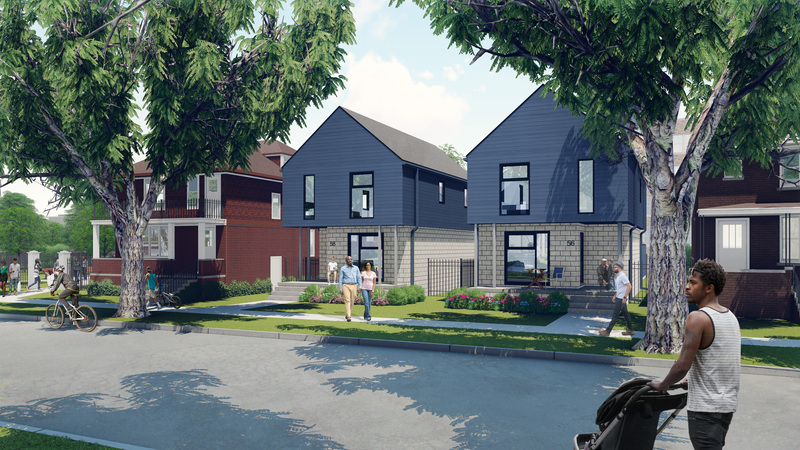 Develop Detroit, a mission-based nonprofit real estate developer, today broke ground on a for-sale homebuilding and renovation project in the North End (north of New Center) and Grandmont-Rosedale neighborhoods. The project will renovate vacant homes and build new ones on vacant lots — the latter would include single family homes and attached homes, such as duplexes and triplexes. In the first phase of the program, scheduled between now and August 2019, 12 new homes are expected to be built, and seven are expected to be renovated in the North End, while 11 will be renovated in Grandmont-Rosedale. In phase two of the project, scheduled to take place between 2019 and 2021, Develop Detroit plans to add up to 40 homes. Renovations are slated to begin in June. The project is Develop Detroit’s first steps into homebuilding and will be the first scaled, for-sale new construction in the North End in decades. Homes built in Grandmont-Rosedale will be in partnership with the Grandmont-Rosedale Development Corp.
Housing Partnership Network (HPN), a business collaborative of 100 of the nation’s leading affordable housing and community development nonprofits, has also backed Develop Detroit. JPMorgan Chase and Co., The Ford Foundation, and the Kresge Foundation invested in Develop Detroit.